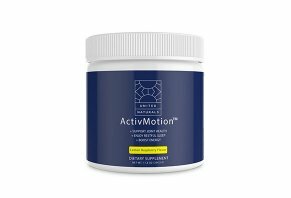 ActivMotion Review - Experience Pain Relief? ActivMotion is a water-soluble collagen supplement that contains a proprietary mix of ingredients that its manufacturer, United Naturals, claims will help you alleviate aches and pains. United Naturals’ Chief Wellness Officer is Dr. Vincent Pedre who, according to the United Naturals website, is a functional medicine certified practitioner. The site says Pedre graduated from Cornell University “with honors”. He also graduated from the University of Miami School of Medicine. We did a quick check of his credentials and found that U.S. News & World Report lists Dr. Pedre as being affiliated with New York’s Mount Sinai hospital and that Pedre did, in fact, graduate from the University of Miami’s medical school. At the time of publishing, Pedre’s LinkedIn page confirmed this information. United Naturals’ ActivMotion seems to provide benefits for your joints based on the collagen and propriety spice mixture in its powder. And, United Naturals notes, the product has been tested by an FDA-approved lab. In this review, we’re going to examine how the product works, the ingredients and dosage amounts in ActivMotion, as well as the pricing and refund policy of the product. At the end of our review, we’ll give you a few conclusions that will help you decide if this particular product is right for you. As we mentioned in our introduction, ActivMotion is a power that you mix with water and drink. According to the back label of the product, you should mix 1 teaspoon of ActivMotion with 6-8 ounces of water and mix it well. The product contains cow and chicken collagen, as well as a resin extract of Boswellia serrata, turmeric root extract, Stevia leaf extract and black pepper fruit extract (more on those in a few minutes). Drinking in these ingredients, the product’s website says, leads to the relief of aches and pains and, as they point out, your body uses collagen (in general) to strengthen your body and maintain flexibility. According to a March 2018 article from WebMD, collagen is a protein whose main job is to hold tissue together. When tissues hold together – muscles, tendons and ligaments, for example – they're stronger and less likely to tear. But collagen’s help isn’t limited to muscles, tendons and ligaments. WebMD goes on to say that collagen helps skin stay elastic which leads to fewer wrinkle and an overall younger appearance. As you get older, collagen-related aches and pains are more prevalent. For example, Healthline points out, your cartilage weakness and joints that used to move freely now have to contend with aging cartilage and, as a result, you may feel pain in your knees, shoulders and other areas. From a cosmetic perspective, your body produces less collagen as you age and, as it declines, skin flexibility decreases and wrinkles. Each of these ingredients is allergen- and GMO-free, ActivMotion’s packaging says. Also of note is that the label says that a daily value has not been established for the six ingredients, which means, at the very least, there is no consensus opinion among regulatory bodies as to how much of each ingredient you should take every day. Scientific Evidence for the Effects of ActivMotion’s Ingredients. Based on our research of the product’s pair of collagen ingredients as well as its proprietary extract mix, we believe there is some scientific evidence that would lend legitimacy to ActivMotion’s claims that it can ease aches and pains. In this section, we’ll do a quick overview of what existing studies say about each ingredient. Based on our research of existing studies, we believe that collagen has the potential to provide your skin with more collagen content and, because the substance is high in protein, it has the potential to help you build muscle and burn fat if you add collagen to your weight-lifting routine. These conclusions come from a pair of studies, both of which WebMD references in their 2018 article about collagen we referenced earlier. The first study tested collagen on 69 women age 35-55, some of whom took 2.5-5.0 grams of collagen daily for eight weeks and some of whom took a placebo. The second study came to light when a team of German doctors published their results in the British Journal of Nutrition. They gave 15g of collagen supplements daily to older men (72.2 years, on average) who were dealing with sarcopenia, a condition in which muscles become weaker with age. The doctors concluded that, while most research focused on how collagen can help your skin, there seems to be some grounds to support the idea that its high protein content can help strengthen your muscles along with weightlifting. WebMD has a formidable list of potentially helpful uses of cow collagen, all of which require a topical application. The list does not include any uses that rely on a drinkable collagen solution. These four ingredients make up the proprietary mix that ActivMotion claims will ease your aches and pains. According to a conversation with an ActivMotion chat representative, Stevia is used purely as a sweetener and has no specific value for joint pain or helping strengthen your body. Turmeric contains curcumin, which, as mentioned in the previous section, is a property that your body uses to fight inflammation. As we point out in our guide to turmeric and curcumin, there seems to be enough evidence to support the claim that it can help with joint pain. Consumer Lab notes that the extract from this pepper fruit contains piperine, which, according to the site, has the ability to help your body more efficiently use curcumin, an anti-inflammatory property found in turmeric. This extract is more commonly known as Indian frankincense and is a tree-based ingredient that, according to Examine.com, has shown in some studies it can be effective in fighting inflammation and pain related to osteoarthritis, the most popular form of arthritis. Based on our research of various articles covering the side effects of collagen, we found one side effect mentioned: mad cow disease. WebMD notes that, while no link has been made between mad cow disease and human consumption of bovine collagen, it’s best to avoid products that use ingredients made in counties where “mad cow disease has been found”. We did some quick research and found that there are only a few instances of mad cow disease in the United States, such that, according to the CDC, you shouldn’t be worried about the disease making its way into the food supply. The sources we read put an emphasis on pregnant women avoiding the addition of these various ingredients to their diet. The suggestions weren’t so much based on data as they were on the “better safe than sorry” mentality. If you aren’t satisfied with the product, you have 30days from the date of purchase to return it for a full refund, according to United Naturals’ fine print. Also, you’ll be responsible for return shipping costs. To start the refund, you need to call 1-844-794-7728 to process the refund. When you get ready to buy your product online, ActivMotion will give you the option of signing up for a subscription plan. This plan will send you shipments and charge your credit or debit card automatically. According to the terms and conditions, ActivMotion won’t sign you up without your permission. If, for any reason, you want to cancel your subscription, you can do so by phone (1-844-794-7728) or email (support@unitednaturals.com). Pro tip: Shipping is $5 for a single-jar order and free for multiple jars. Estimated shipping time for all orders is 3-8 days. Based on our research of this supplement, we believe there is sufficient evidence to believe that the various ingredients ActivMotion contains can have a positive effect on the “aches and pains” that you may feel in your joints. These ingredients directly affect those ailments in two ways, the research seems to suggest. First, curcumin has been proven in certain situations to reduce inflammation, which can reduce pain. Second, the protein content in collagen can strengthen your muscles when used conjunction with resistance training, which can include lifting weights. With these in mind, it’s important to balance the benefits with the fact that there is no formalized body of evidence we found, either on websites or in journals, that provides parameters for how to take curcumin and collagen (pill form, topical, water-soluble). Therefore, we cannot say with certainty either way if taking a water=soluble form of collagen or curcumin will be as effective as what was observed in the studies we referenced earlier. Also, keep in mind that there are collagen and turmeric supplement pills at big-box stores like Walmart. Buying a jar of each supplement could end up costing you less per month than ActivMotion. My knees began giving me trouble - then I saw an advert online. I am 77 years old, very active and not over-weight. Friends were having knee operations all around me, so I decided to try your ActivMotion supplement. Slowly and surely after perhaps one month I realized I had found an amazing product having completely used two months supply and just beginning my third. I do know that I am sleeping better too. Thank you for a great product. I am a new customer pretty much using ActivMotion. I suffer from sciatic nerve pain and a bad knee due to osteoarthritis. I decided to try this product since this winter I experienced a lot of pain due to changes in barometric pressure. Approximately 4 days after using ActivMotion I realized my pain in my back was under control and my knee also had less pain. I could finally walk normally instead of always favoring my left leg. I knew I had to continue taking this supplement since it changed my life. I have taken Curamin tablets for years but never felt like I was truly benefiting, but since I have been taking ActivMotion my whole body feels better, I have more endurance and movement! Thank you very much! Also, it tastes great! After listening to the presentation, I chose to try it and get off of the Aleve last Nov. It works well in reducing the muscle pain I was experiencing. I sleep better at night, which is allowing me to get back to the gym. I purchased this product for its joint, sleep, and energy aspects. I immediately noticed after drinking it I had a really good feeling inside, hard to explain, but I can't wait to drink it every day. About ten days after starting it I noticed skin changes, kind of dramatic! I had been complaining my skin had changed of late. It was getting dryer and even painful. No matter how much or expensive a face cream I used, it was still dry. My skin now feels moist, supple and no longer painful. Clearly works from the inside out and I couldn't be happier. In less than a week of taking ActivMotion, the swelling in my ankles shrank. The pain is slowly going away. I can't wait to finish the product in one month so I can testify how truly effective this product is. Imagine, in just a few days, the results were already amazing! I recommended this to my sister in the Philippines and she already ordered one! I’ve been taking Advil PM for both knee help and sleep. After the bad press and reviews that constant Advil use was getting, I have gone to this more natural way of relief. It is working and I’m taking melatonin for my sleep. A win-win combination. Doc, I’m not sure what’s in your formula for active motion. I read it, but I’m not a chemist! But whatever it is, it’s miraculous in its effects! I ordered based on the informational vid and was skeptical. I was to the point where I was considering a cane or walker. Just 8 months ago I was still riding my motocross bike and not sure what happened, but my knee started giving me pain and slowly became so bad that I could hardly walk! After several treatments, starting with cortisone, with no relief, then switching to Euflexxa with marginal results, several times I had to resort to OxyContin to control the pain. Now, I’m not a wuss as I have broken bones, torn my rotator, so I’m no stranger to pain and am not sure why my knee was so off the charts? I reluctantly scheduled to have my knee scoped, I was slipping into a depressive state as I couldn’t believe that at my age I would be so incapacitated. After two weeks of using your formula, I can now walk again and the pain is greatly diminished! It’s now April and I am looking at throwing a leg over my bike again. I am also using a CBD oil in conjunction and believe it does help to control the pain but does nothing to help in the motion and functionality of ALL MY JOINTS, my sincerest thanks! I got some ActivMotion a couple of weeks back due to the fact that my knees always ached. I have been taking this for two weeks now and my knees feel really good. Not sure if it was the weather warming up or ActivMotion, but I believe that it is the supplement since I am able to hike again with my wife and do things I couldn't before. Give this a try, it might work for you as good as it has me. This order is for my mom to see if it will help her become more mobile. We shall see. I have been on ActivMotion for three weeks now. It has given me more energy and I sleep great at night, less pain, my skin looks better. I can't believe how it has helped me will stay on it, and all it is a scoop a day and the taste is good. ActivMotion provides me with the relief I needed from arthritis in my joints and back. I am very pleased with the results because I feel better about taking the product. I intend to take it regularly and see if it improves the inflammation in the joints. Write a Review for ActivMotion!